We helped Penguin Random House and Jamie Oliver Ltd promote Jamie Oliver’s Christmas Cookbook on Facebook and Instagram. Our aim was to enhance engagement and drive traffic through website clicks, video views and book sales on Amazon. The specific audiences we targeted were highly engaged by our video and static ad recipes. We delivered remarkable results in terms of CTR, cost per click, cost per view and general engagement. 38 different audiences were targeted throughout the campaign with ads promoting tasty recipes from the cookbook on Jamie Oliver’s website and Amazon buy pages. The main objective was to boost social engagement, drive traffic to the website and subsequently book sales. We used both video and static ads to promote the recipes, focusing on the best performing ad formats, while narrowing the targeting every few days to ensure the message was delivered to relevant audiences. 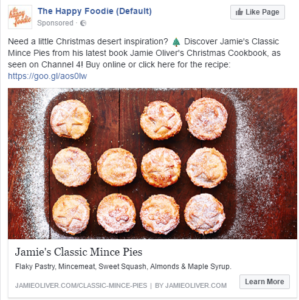 During the campaign, we added a note to the ad copy mentioning “Jamie’s Ultimate Christmas” TV show on Channel 4, so audiences could make the connection between the recipes, the show and the new cookbook. Jamie Oliver’s Christmas Cookbook was Amazon’s #1 bestseller in the Festive & Seasonal Dishes category.